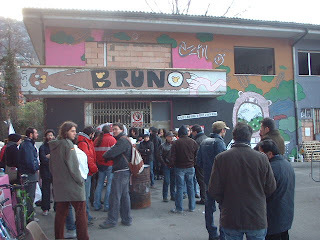 There have protests, street blockades and barricades in the Italian city of Trento following the eviction by riot police of the Bruno Social Centre on March 21st 2007. A demonstration has been called in Trento on April 21st in defence of occupied social centres. The call states: '"We believe that social spaces are not only made by physical walls, but they are also places in where the growth of political participation is formed, opportunities for alternative lifestyles and places of innovation and the construction of new social relations. Everywhere Social Centres represent the prototypes of the 'Other City', the city of welcome and inclusion, the city of rights, dignity and new citizenship... A Social Centre represents the melting pot of struggles and dreams, the forge of radicalism and new ways of fighting, a machine that is self-managing and self-producing. We want the 21st of April to be an important day of mobilization and fighting to affirm with great determination the movements’ autonomy, represented for us by the bear “Bruno” that travels free throughout the Italian and the European territory, independently managing its time, its life and its dreams". A friend who visited the centre reports that as well as hosting various political initiatives, the space was widely used for parties, with drum and bass being very popular (a recent programme also shows northern soul, disco, rare groove and dancehall DJs). I was particularly intrigued by his report of a night featuring Gli Orsi delle Alpi (Bears of the Alps), an anti-fascist scooter club playing northern soul and related sounds.